Hanna House On Stanford campus, (650) 725-8352. Tours on 1st & 3rd Sun at 11, and on 2nd & 4th Thur at 2. $10, parking $5. Reservations required. No children under 12. 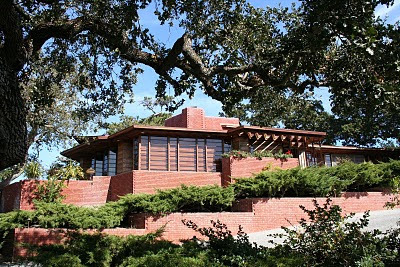 Nicknamed Honeycomb House, this 1937 home designed by Frank Lloyd Wright is built of glass, brick, and redwood and has no 90-degree wall angles. Everything is composed of honeycomb-shaped hexagons that are repeated throughout in tiles and furnishings. (When Wright was designing this house, he was at a turning point in his career. Later, he went on to use some of the ideas he originated here to make waves with his design of the Guggenheim Museum in New York.) Wright autographed his works with a signed tile in his favorite shade of red. Here you will find that tile mounted on a carport support in the courtyard. An expansive yard includes an enclosed swimming pool, water falling over a staircase-style fountain, and a Japanese-style garden framing a fountain that is being restored. It is interesting to note that the Hanna’s three children all bought Eichler homes. See my more detailed article.